I promised a story to go with yesterday’s picture of “The Ring”. By the comments you probably have figured out that it was my mom’s ring. 31 years ago I was a 16 year old girl working as a waitress for a small town restaurant. I made a whopping $1.50 an hour, plus tips! I wanted to buy my mom a “Mother’s Ring”. At $1.50 an hour, that took awhile! I put it on lay-away and paid on it for 3 months! To say my mom was surprised when I gave it to her would be an understatement! 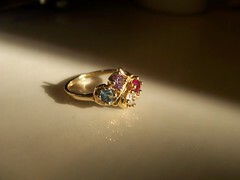 Since my brother and I are the only children, I chose to have Dad’s and Mom’s birthstones put in there as well. Mom wore that ring all the time. I remember once she had a window slam down on that hand, and her fingers swelled up. She was worried that the ring would have to be cut off. Thankfully it didn’t! Imagine my sorrow when she told me, about a year ago, that she lost the ring. She wondered if she had lost it at the house before she moved, but I was sure I had seen it on her finger since then. Then she thought maybe she lost it in her apartment. She had lost so much weight that I feared she might even have had it slip off her finger unaware–which meant it was truly lost. I did pray that it would be in her apartment, that we’d find it somehow. The day after she passed away, I was at her apartment looking for clothes for the viewing and papers I would need, when I found a check box with a tangle jumble of jewelry. She really liked using check boxes for things! So I described it to her. And I saw what had happened–Mom’s stone had fallen out, and the rest of the prongs were wore down (you couldn’t even tell there were prongs on the outsides of all the stones! ), so she probably took it off and “put it away” so no more stones would be lost. Let me tell you, if there was ever a day I needed to find that ring, that day was it. Mom’s death was unexpected, I was reeling from that plus feeling guilty I wasn’t right there, that I didn’t know CPR (I now understand that it wouldn’t have changed anything)…..
What are the “odds” of that ring showing up on that day? Well, there are no “odds”. But there is God!!!! There are many things He has done for me in the past 3 weeks that show His personal, loving touch. This was truly a hug from Him and a testimony of His love! I had it fixed and now wear it sometimes. I’m not really into jewelry, but this isn’t a fashion statement. It’s a FAITH statement and a TESTIMONY of a God who loves me, who is my Abba Father, who cares about the smallest of things in our lives and wants me to invite Him in to everything I need, want, do, think and say. He wants to be an intimate part of every facet of our lives. However great or small–might be a lost item, might be a lost relationship. Either way, your Abba Father cares. He wants to be a part of it. Then maybe you will have a wonderful testimony to His greatness, faithfulness and love.